I walked around in a cold, darkened room, and there it was—Gustave Courbet’s The Painter’s Studio. I stood in awe for a moment, taking it in. I walked near it to see the details of the paint. I moved back so I can see its entirety once I again. I sat down on the bench and I cried, the emotions overflowing. I never thought it would be like this, to sit here and wonder. Today’s assignment is about a room with a view. If I could travel through space quickly, where would I choose to be? My immediate thought was Berlin, one of my favorite cities. But lying in bed, my mind went to Musée d’Orsay and Gustave Courbet’s The Painter’s Studio. It was the very first time that I felt so emotional while standing in front of a painting. I was exhausted at the time. Paris proved to be so overwhelming compared to Berlin, everyone seems to be rushing. I often felt that tourists will crush me. There seems to be no quiet moment here. Then I went to Musée d’Orsay, and it all changed. I remembered why I was here. I remembered the power of art. When the opportunity came, I knew I had to see what I’ve only known through books and online images. The small reproduction in books and even the high-definition reproductions online did not prepare me for the intensity of Courbet’s painting. It was larger than an ordinary wall, at the height of 361cm and width of 598 cm. I am not so good with numbers but the best way I can elaborate the sheer size of this painting is a large, high-ceiling wall, full of images to overwhelm. Absorbing the details would be challenging at first, as you try to take in the magnanimity of the oil paint. Yet, this is a realist work. It directly challenged the academic style of the time. It is important to note the political charge of realism. Aside from his paintings, Gustave Courbet was known to write the Realist Manifesto, in a similar vein of a political manifesto in 19th century France. He was imprisoned because of his political activism in the Paris Commune. The 19th century was also the time that Karl Marx and Friedrich Engels wrote the Communist Manifesto that inspired various proletarian revolutions. These circumstances would resonate in Gustave Courbet’s work, particularly in The Painter’s Studio. The Painter’s Studio features a room divided into two sides. On the right, there is a formal feeling amidst the art collector, critic, writer, and lovers. While on the left are everyday people such as a priest, hunter, model, and beggar. The challenge of combining the two seemingly opposing sides lie with Gustave Courbet, as he painted himself in the middle. With him is his female muse, a child and a cat. This divide and conversation still resonate today, as one part of society thrives through elitism while another part languishes in poverty. The most poignant part is the role of the artist in between. Art should not be a divisive platform but something that should remove such a divide. Gustave Courbet bridges the gap and in my idealist mind eventually creates an egalitarian society. The Painter’s Studio is not just a criticism of the time but also a challenge to the role that the artist and art can perform in a divided society. 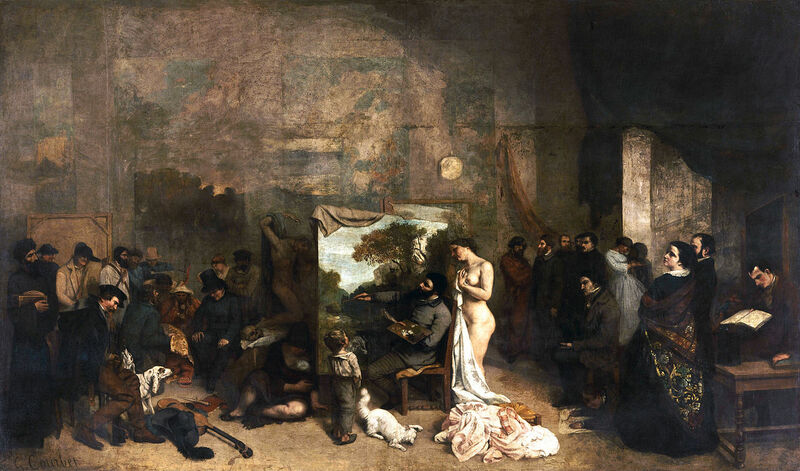 The Painter’s Studio was rejected by the 1855 Universal Exhibition. This prompted Gustave Courbet to pull out all his works and create the Realism Pavilion, a solo exhibition at his own expense. This would serve as an inspiration later on for Impressionists and their Salon des Refusés. Though the Impressionists would still feature everyday life in their works, it is not as politically-charged as the Realists. Realism claimed everyday life and looked at poverty and suffering straight in the eyes. They rejected the elitism of academic art and looked at the proletarian that was historically ignored, giving inspiration and fire to the revolution. My mind brings me back to that bench, as I was sitting there, looking at the painting. It was cold and dark. The lighting gives the painting a little glare so you need to move a little to see each part. The tourists seem to be rushing about, noisily, most times. As I stayed there for a while, I eventually caught some silent moments with the painting. I want to hold that moment in space and time, as passion burns for the labor that I love. In the vein of Courbet’s work, I hope for a revolution yet to come. You’ve made this prompt your own in such a spectacular way. I didn’t expect to be reading about art today, that’s for sure. Your description really made it seem that I was stood in front of the painting as well. Now I feel like I’ve got a long way to go! Thanks! I love art and I love writing about it, though I’m not so confident about it at times. A writing journey is certainly something that never ends, I wish I have your way with describing things. This entry was posted on April 7, 2015 by Portia Placino in Art History, Art Writing, Diary of a Grad student and tagged art, Art Criticism, Art History, Musée d'Orsay, Painting, Paris, Writing, Writing101.